Nemi Eco Villa was designed and built with two things in mind: being conscious and friendly to the environment all the while not sacrificing on any luxuries. It is modern, comfortable, extensive, and most of all relaxing. Nemi Eco Villa is the perfect place to host your next group event and take a break from the world in your own private eco-paradise. Outdoor Bar and Lounge area. Continental breakfast daily included with your rental. Spa Room with air conditioning, rain shower and body sprays (can be used as additional sleeping room with upgrade fee). Open Living & Dining Room. Large outdoor double wood grill. Free high speed (fiber optic) internet throughout the villa. Secure safe in common area. Large Wine and Beer Cooler. Recycled shipping container pool and bedroom pods. Solar panels for power in pool and bedrooms. Grey water collection for watering garden and other uses. Ecological, sustainable, or repurposed construction materials. Locally sourced products for breakfast meals. Nemi Eco Villa is located in the quiet neighborhood of Amapas, close to downtown Puerto Vallarta and the Romantic Zone. Less than 3 minute drive to downtown Puerto. 5 minute walk to Playa Los Muertos beach. 5 minute walk to Playa Conchas Chinas beach. 1 minute walk to the main local bus line. Easy access to local beaches and small villages like Mismaloya or Boca de Tomatlan. Quick 30 minute drive from Licendiado Gustavo Dîaz Ordaz International Airport of Puerto Vallarta. 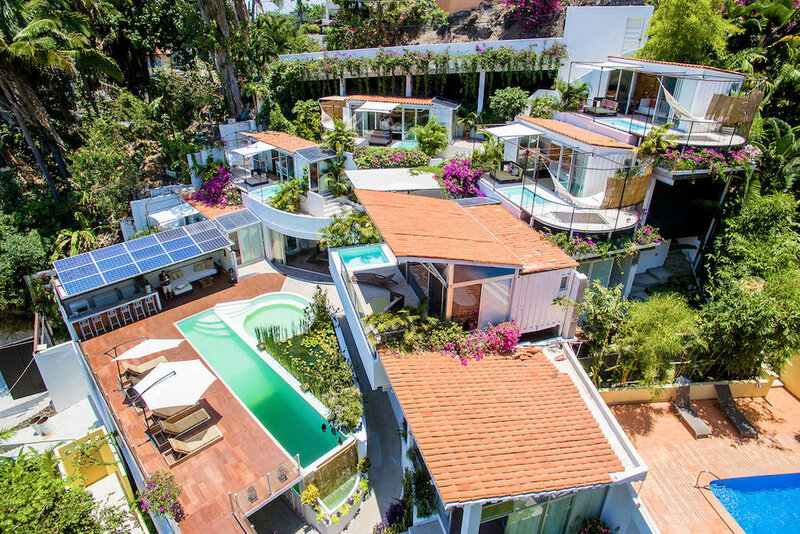 There are 6 individual bedroom pods that have been constructed from repurposed shipping containers and all run on solar power. They have been strategically placed on various tiers along the hillside property in Amapas, each with their own incredible ocean and mountain views. Each are designed with large decks complete with individual dipping pools, gravity fed showers, locally woven hammocks, wifi, and energy efficient air conditioners. Ocean and jungle views from each bedroom.